Gainesville, FL – Strong efforts from Admiral Schofield and Jordan Bowden weren’t enough for Tennessee, as the Volunteers lost to 24th-ranked Florida, 83-70, in Gainesville on Saturday. 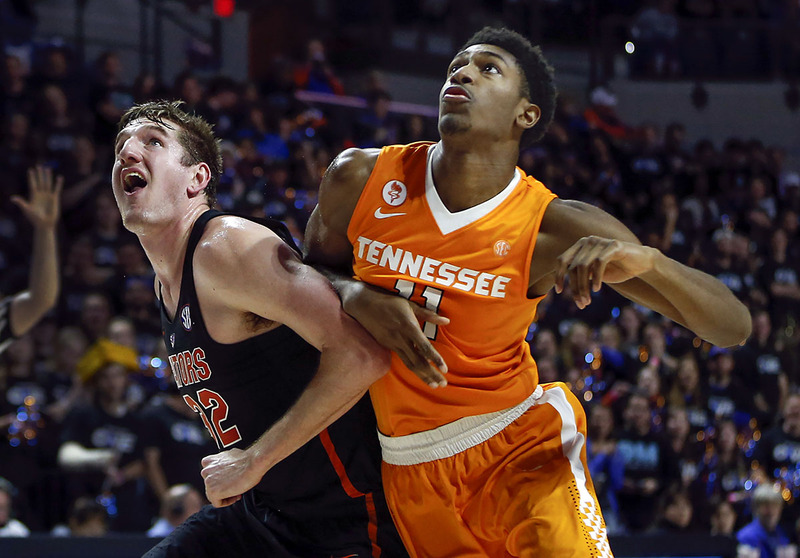 Schofield turned in his most complete performance of the season for Tennessee (8-7, 1-2 SEC), finishing with 18 points and 10 rebounds for his first career double-double. He was joined in double figures by Bowden, who hit three 3-pointers en route to 15 points. A back-and-forth contest for much of the way, Tennessee grabbed a 33-32 halftime lead after shooting 48 percent in a first half that featured eight lead changes. The Vols were boosted over the opening stanza by a strong defensive effort. UT held Florida (12-3, 3-0 SEC) to just 37.5 percent shooting while forcing nine Gator turnovers. Those takeaways translated into 15 points for Tennessee and the Vols also owned a 12-2 edge in fast-break points through the opening 20 minutes, contributing to the slim halftime lead. The script flipped in the second half, however, as defensive stops became difficult to come by for the Vols. Florida shot 16-of-24 from the field after halftime, including a key second-half stretch that featured nine consecutive made field goals. The Vols were buoyed in the second half with a pair of Bowden threes right out of intermission, giving UT a 39-34 advantage. The Gators would respond with a three of their own though, triggering a six-minute stretch in which UF made nine straight field goals and grabbed a 56-52 lead with 11:20 remaining. A couple free throws and a jumper from Schofield leveled things again at 56-56, but a quick 10-3 spurt gave Florida some breathing room with just under seven minutes to play. UT whittled that deficit to three, 66-63, but timely 3-pointers from KeVaughn Allen (23 points) and efficient free throw shooting over the closing stretch allowed Florida to see out their third SEC victory in as many tries. The Vols host South Carolina Wednesday at Thompson-Boling Arena (5:30pm CT, SEC Network). The Gamecocks (12-3, 2-0 SEC) have defeated Georgia and Texas A&M thus far in conference play.